Guinea worm disease, scientifically named Dracunculiasis and nicknamed The Fiery Serpent based on presumed biblical references, is a water-born parasite that causes a painful blister from which a worm emerges. The disease can be so debilitating that a patient is unable to walk for several days or even weeks until the worm is completely removed. Closely tied to issues of water shortage, Guinea worm is spread when a patient with an emerged worm walks inside a source of drinking water and the worm lays its eggs. In Ghana's Northern Region, many communities have only one small, contaminated dam from which they fetch their drinking water, causing the area to be one of the few remaining places on earth that are highly endemic with Guinea worm disease. UPDATE: This photo essay contains images from 2006-2008. Ghana was certified as having eradicated Guinea worm disease in 2015. Children collect drinking water from a reservoir in Wantugu, Northern Region, Ghana on Jan. 4, 2007. The dam dries up for several months during northern Ghana's dry season, and the people of Wantugu have to walk several miles to the next village to get water. Guinea worm is a common problem in communities that get their water from one small, contaminated water source. Women carrying water pass through a children's soccer game in Wantugu, Ghana on Dec. 21, 2006. Child Guinea worm patients at a Guinea Worm Case Containment Center in Wantugu, Ghana, December 9, 2006. The overwhelming majority of Guinea worm patients are children, as they are less likely to check if their drinking water has been filtered. Mariam Inusa, 15, cries out in pain as health workers pull on the Guinea worm in her leg, attempting to remove it, at her home in Savelugu, Northern Region, Ghana on Jan. 26, 2008. The worm in Mariam's leg was finally pulled out after several days of bandaging. Family members and health workers had to hold Mariam still so that they could pull on the worm without fear of Mariam jerking her leg away and breaking the worm. Health workers massage the area around a Guinea worm on four-year-old Samata Baba's ankle, hoping to pull more of the worm out, at Samata's home in Savelugu, Ghana on Jan. 26, 2008. During a painful bandaging routine, a patient's worm is pulled a little bit every day and then wound onto a piece of gauze and bandaged in place. Erahmah, a young girl with Guinea worm disease, lies on a mat on the floor of a Guinea Worm Case Containment Center in Wantugu, Ghana on Dec. 27, 2006. She complained that the Guinea worm in her foot was so painful that she could not walk, even to get food for herself. Health worker Abukari Memunatu, center, bandages a woman with Guinea worm disease in the woman's home in Kanfehyili, Northern Region, Ghana on Jan. 24, 2007. Pain in the woman's leg caused by an emerged Guinea worm made it difficult for her to walk, so health workers visited her in her home each day. 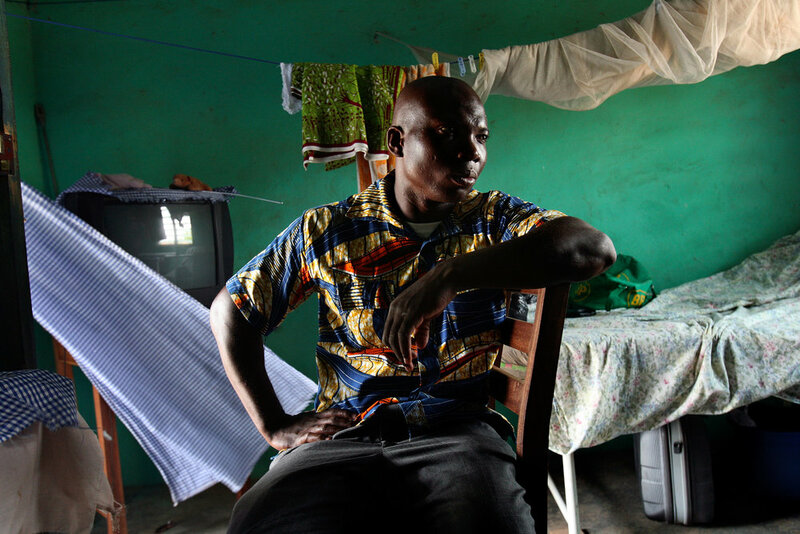 Sualey, a Ghanaian National Health Service Volunteer, examines a cloth Guinea worm filter in a home in Wantugu, Ghana, during a routine house-to-house filter inspection on Aug. 15, 2007. A simple cloth filter is enough to remove Guinea worm from drinking water, but house-to-house health education is necessary to make sure people are using the filters properly. A young girl waits for water to flow from a tube being pumped out of Difibihini Dam in Savelugu, Ghana on Jan. 25, 2008. In addition to possibly being contaminated with Guinea worm, dam water is the potential cause for other water-born illnesses. The dam is shared with livestock, including cattle, which wade and defecate in the water. Women gather water from a hand-dug well in Wantugu, Ghana on July 15, 2007. During Ghana's rainy season, wells such as this one collect water that is accessible and free of Guinea worm. Children wait for water at a drilled borehole well in Wantugu, Ghana on Dec. 21, 2006. Several such wells have been installed as an attempt to solve the village's severe water shortage, but the water table in the ground is too low, and sometimes it can take up to forty-five minutes to fill a single container with water. A young girl named Nemaatu is treated for her infection, caused by a dead and calcified Guinea worm in her leg, in the Wantugu Health Center in Wantugu, Ghana on Aug. 20, 2007. Nemaatu is treated for her infection. 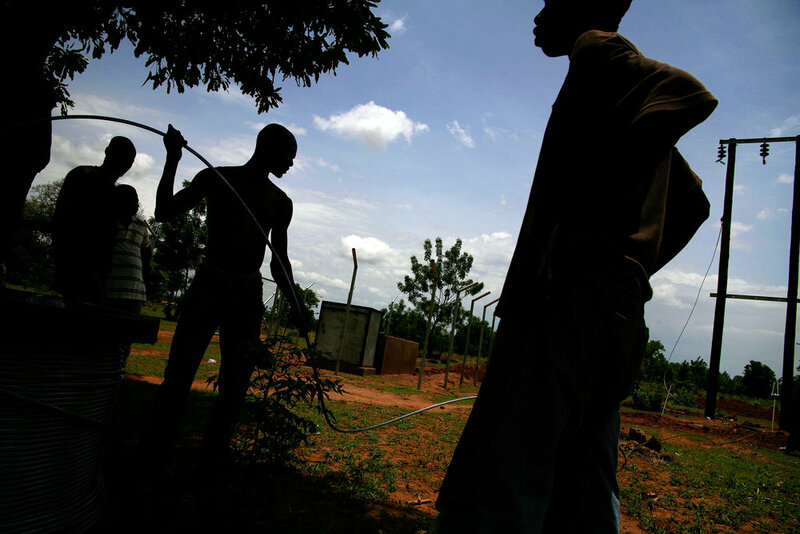 Electricians install power lines in Wantugu, Ghana on May 5, 2007. The lines are to be connected to a water system that will pump water from a drilled well to several distribution points in the village, alleviating both problems of water shortage and Guinea worm. Wantugu does not otherwise have electricity. Community members build one of the distribution points for the new water system being built in Wantugu, Northern Region, Ghana on May 16, 2007. The system pumps clean water that is free of Guinea worm to the midst of the village, allowing people to walk a shorter distance to collect drinking water. Ghana Guinea Worm Eradication Program Area Coordinator Faisal Hudu in the Savelugu Case Containment Center in Savelugu, Ghana, April 29, 2008. Sualey, a Ghanaian National Health Service Volunteer, quizzes children on Guinea worm prevention in the Wantugu Roman Catholic Primary School in Wantugu, Ghana on March 14, 2007. Over a year after the project was initiated, women gather around a distribution point at the recently completed water system in Wantugu, Ghana on Nov. 16, 2007. Some health workers fear that, despite the health benefits, villagers will not use the water system because they have to pay a small fee every time they fetch water. Girls wade into a reservoir in Wantugu, Ghana to fetch water on Aug. 18, 2007.